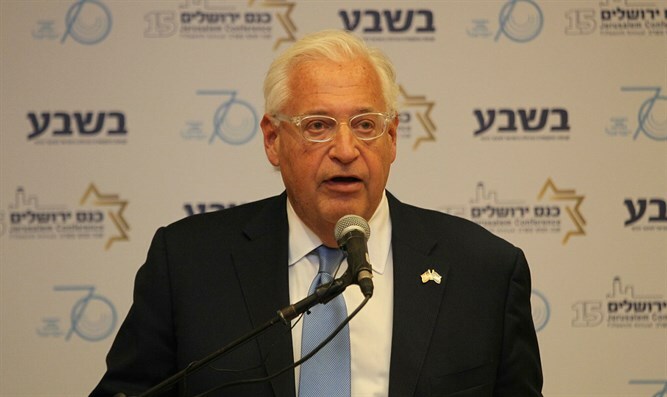 US Ambassador to Israel David Friedman on Monday night responded to Palestinian Authority (PA) Chairman Mahmoud Abbas' claim that he was the "son of a dog" and a "settler." In his Ramallah speech, Abbas said, "The United States legitimizes settlements. That's what American officials do, and at their head, in Tel Aviv, is David Friedman. He said, 'They're building on their own land.' The son of a dog, they're building on their own land? He himself is a settler, and his entire family are settlers." Speaking at the Global Forum for Combating Anti-Semitism, Friedman said, "Three Jews were killed in cold blood by the Palestinian terrorists, and the reaction from the Palestinian Authority was deafening. No condemnation whatsoever. I pointed that out, without further adjectives, without further commentary." Meanwhile, Education Minister Naftali Bennett (Jewish Home) said, "David, after just one year in office, we can already see that you're going to go own in Israel's history as a true friend of the State of Israel." Israeli Prime Minister Binyamin Netanyahu responded, "Abu Mazen's remarks about US Ambassador David Friedman say everything. This is the first time in decades that the US government is no longer spoiling the Palestinian leaders, and he's telling them: Enough. Apparently the shock of hearing the truth made them lose their senses."